An exclusive Lucio Parrillo cover, only available to comic shop subscribers and limited to initial orders. 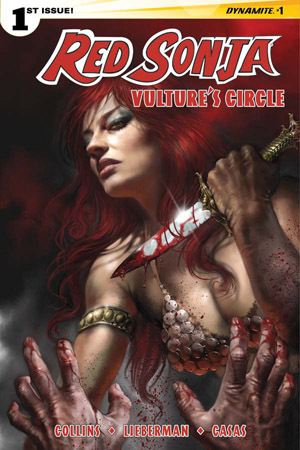 In this issue, the new-born Sutekh leads a fearful army and uses powerful sorcery and a menagerie of demonic war-beasts to break the will of his mortal enemies as he marches forth to conquer the kingdoms of the Hyborian Age, defeating foe after foe - until he crosses the path of an older, battle-scarred Red Sonja, who has exchanged the life of a mercenary for running a school for sword-maidens. Can Red Sonja and her prize students, Lyla and Xoana, defeat the evil Sutekh and his private army of ghouls and devils with the help of the renegade Stygian priest, Sefkh, or are the Hyborian Kingdoms doomed to fall before the pitiless "Son of Set"?